Hi Babes! Happy, happy Hump Day! It’s a little bittersweet for me, I’ve had to turn down two very exciting trips this month for ‘adult’ reasons and it makes me a little sad. I always say traveling with friends and loved ones is the best thing you can invest in but sometimes you just can’t do it. (I’ll elaborate more on this in a later post, that’s not why we’re here today!) I’ve felt FOMO before, but I swear there isn’t any missing out like missing New York Fashion Week. On a better note, I’m so excited to kick off the Dear Riley: Q&A series because I feel like I’m constantly yapping away telling y’all tips, tricks and ideas on how to live your life, but if you don’t know anything about me why should you trust me?! I know a lot of bloggers say ‘We’re BFFS, duh! ?’ but I truly, truly mean it. I rarely filter any part of our life (if I do, it’s most likely because it’s a HUGE snooze fest) and I want to be 100% transparent with y’all! That is why I created this little post series where I can answer your anonymous questions with 100% honesty. If you want to submit a question, suggest a topic or give me some criticism please, please do so HERE. I love more than anything to hear what you think, the good, the bad and the ugly! Q: I am thinking about starting a blog but I feel like there is just no way I could make it successful. When did you start blogging and how long did it take for you to feel like you actually started becoming successful? I’ve received emails from girls saying I helped them feel better more confident about themselves. I’ve helped girls find new recipes to try. I was invited to New York Fashion Week, something I’ve only ever dreamed of doing. Most importantly, I have continued to do something challenging for three years that I absolutely love, that makes me so happy. Maybe I’m not receiving the exact same campaigns as some bloggers, maybe it’s not my full time job yet, maybe I have less followers than some but I am successful. My advice is to set small goals and work towards them, but never stop and always make sure you’re blogging because you love it. If you love it, then you’ll always be successful too! Q: How do you go about planning your blog posts? A planner? A month out? A week out, etc.? A: Blog posts are a lot more than meets the eye. Sure, they are composed of a few pictures and a couple of paragraphs.. seems simple right? Wrong. While I love, love, love doing it, there is more than just snapping a few photos and writing a paragraph. There’s a process and from the time I think of a potential post to the time you read it, there’s about a month or so work in between. First, I think up an idea for a post. Some of the posts just come to me while I’m doing a random task, some I think about for weeks or some I think of to align a brand with an outfit or an outfit with a brand etc. Anytime I get an idea I write it down. This is so important because I will forget. I keep a running list of post ideas in a notebook, but I also keep a list on my phone (if I think of one on the go). Once or twice a week, I sit down with my notebook of ideas, my planner and a monthly calendar I have devoted to my blog (the kind with little squares, where you can see the whole month at once). I decide which posts I’m ready to shoot. I then schedule a day to shoot the posts. In my planner I write everything I have to shoot, which outfit I’ll wear in each post, any ‘props’ or ingredients I’ll need for the post and which poses I’l need to shoot. After shooting everything I then go to my square calendar and decide which day the post will go live. I try to space it out so you’re not getting all of one type a post a week (ie. back to back recipes or all outfits, etc.). I usually write the actual blog post a day or two before the day it’s scheduled to go live! Being prepared has helped me stay consistent, organized and not go insane with all the other events happening in life. Q: What do you use to shoot and edit your pictures? Q: How do you design your logo/recipe lettering? A: I use PicMonkey to create all my recipe cards (did you know you can hover over them to pin them to your Pinterest page?!). They have free fonts or you can import your own from Pinterest. I cannot remember step by step how to do that, but I googled it! Q: I’m thinking of starting my own lifestyle blog. Do you recommend I have on Instagram account dedicated to my blog and [one to my] personal life? Do you have two separate ones? A: This is tricky. I often go back and forth on this answer. I do have two instagram accounts, do I recommend it.. no. While it’s nice to be able to instagram that slightly blurry, over filtered picture from a concert or late night with the girls, it’s not totally necessary and I think it’s taken time away I could have devoted to my blog instagram. Honestly, I rarely ever post on my personal account and 99% of the time I post on my blog account. If I had to do it over again I would definitely not create a separate account. If you’re worried about people ‘judging’ your blog pictures, don’t worry! The people who don’t want to see them can unfollow, it’s their loss. I know it’s scary to worry what people will think about your new adventure (I currently feel the same way about snapchatting selfie videos, it makes me so nervous! ), if it’s something you love do it!!! A: What a question! Whoever asked this one, I like you! I never actually thought about my passions, or at least not in a way that I had to verbalize but I’m glad I did. If you haven’t thought of them before, write them down somewhere.. it makes them feel more real. I think my biggest passions are being happy, living life to the fullest and making sure I never regret something. If I do it, I want to DO IT. Not halfway, I want to try everything I can and make sure I’m doing it to the best of my ability. Whether it’s a friendship, relationship, job, opportunity or travel I am making sure I’m giving my 100%. I also think being myself, expressing myself and staying true to my beliefs is important as well. What are your passions?! Q: What was your major in college? What is your job now? A: School has never been my strong suit. I didn’t study, I’ll admit it now (sorry mom and dad!). I got by without studying and I regret that. I am just like my Dad. We do not do well in a controlled setting. We have a creative mind and we tend to do better when it roams free. Blogging has been an excellent place for my mind because I have 100% control of the whole brand. My major in college was marketing, I worked as a pharmaceutical sales rep for a while (I talk about that more here) and I’m actually starting a new career soon. I’m not sharing the details yet, but I will later this month. I have been blogging for two years and while it requires the attention of a full time job, you will not reap the benefits of a full time career from the get go. Q: How do you feel about cleansing oils and what kind would you recommend? Do you notice your face feeling more oily? Do you still use face wash or just the cleansing oil? A: As of three weeks ago I only wash my face with Dove Sensitive Skin bar of soap. Crazy, I know. Rewind to about three months ago and I began having a horrible rash on my cheeks. It wasn’t acne but it wasn’t just a rash either, it was small, white bumps mixed with red areas and scabs. It was AWFUL. I went to the dermatologist who diagnosed me with an allergic reaction, we aren’t sure exactly what caused but since switching to Dove soap, it’s almost completely healed. So.. I don’t like to give too much advice about cleansing oils because I’m unsure about how my face handles them vs. a face who isn’t allergic. When I was using it, I would remove all my make up with the cleansing oil and then wash my face with an exfoliating scrub afterwards (just at night). Q: Who are some of your favorite bloggers to follow? One of my all time favorite bloggers, who I’ve actually gotten the pleasure of getting to know recently, is Lynlee Poston (@LynleePoston on Instagram). 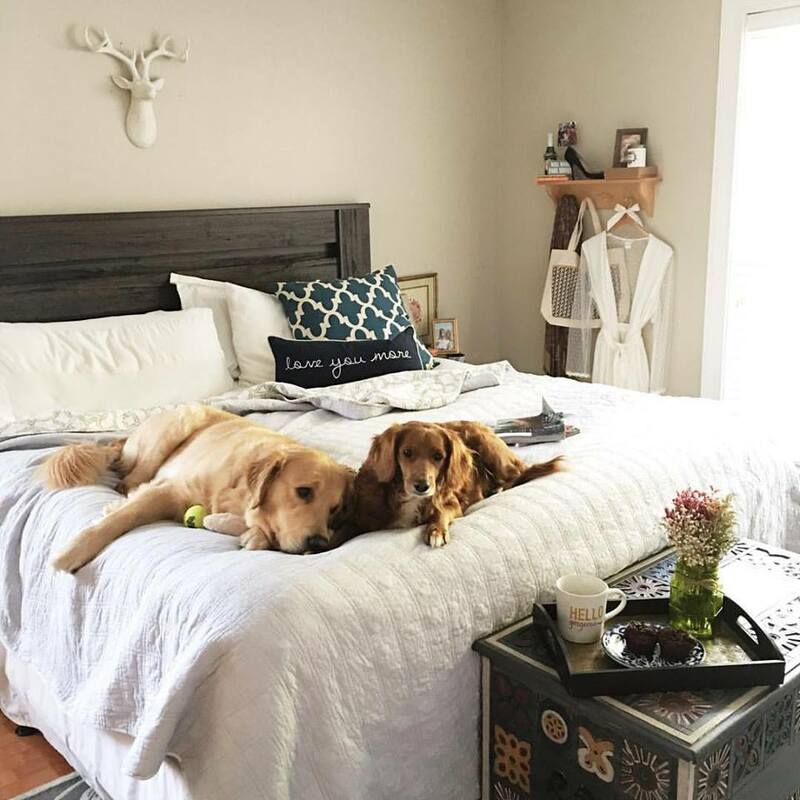 She’s a Dallas cutie with a Golden Retriever and a freaking adorable closet! She’s so sweet and has the most relatable and hilarious captions on her IG (always a plus for me!). I’ve mentioned before I love to follow Very Allegra (Username: Allegraif) on Snapchat because her outfits are adorable and she’s always cooking the yummiest (healthy) food.